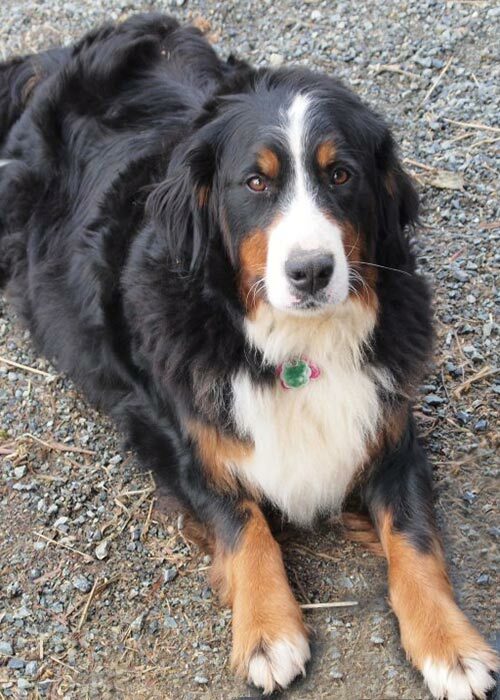 To keep our horses amused we have two Bernese Mountain Dogs – Katie and Belle. From time to time we have the pleasure of having pups from one of the moms. We are expecting our next litter in October 2017! They are Belle’s third litter and she has proven to be a wonderful mom. See pictures below of her first litter. Click to open larger images. 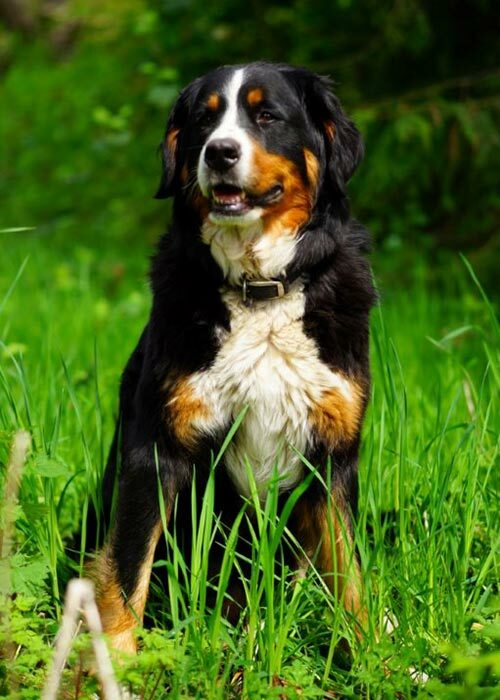 The large, hardy, and sturdy Bernese Mountain Dog can easily manage work involving droving and draft as it has the right combination of agility, pace, and strength. It has a slightly long and square body, but is not tall. Its slow trot is characteristic of its natural working gait, but its driving power is good. The moderately long and thick coat is straight or slightly wavy, offering insulation from extremely cold weather. The dog’s striking tri-color blend (a jet black ground color with rich rust and clear white markings) and gentle expression make it affable. This loyal, sensitive, and extremely devoted breed is reserved with strangers and very gentle with kids. It also plays well with other pets and dogs, and is unhappy if isolated from family activities. The Bernese Mountain Dog is best described as an easygoing and placid family companion. These qualities are noticeable once it becomes an adult. A weekly brushing is enough coat care for this mountain dog. The breed loves the outdoors, particularly in cold weather. Though it can live outdoors in cold and temperate climates, the Bernese Mountain Dog is so attached to its family that it needs to stay close by. Moderate daily exercise, such as a leash-led walk or a short hike, is all the breed requires to remain fit. While indoors, it should be given plenty of space to stretch. The Bernese Mountain Dog also loves to pull things. They love the horses and are happy to stay close by while you ride. They really are amazing companions!